Yoga is increasingly being recommended as a health self-management strategy for people with a range of disabilities. Mainstream yoga media have been criticized for limited representation of racial/ethnic, gender, age, and body size diversity within their publications; however, it is not known how these media outlets include visual representations of or textual information relevant for people with disabilities (PWDs). The purpose of this research was to understand if and how mainstream yoga media visually represent and include information for PWDs. We conducted a content analysis of the “Yogapedia” section of each Yoga Journal magazine published in 2015 and 2016 (n = 17). Two independent coders rated all of the images and text in these sections. Data were analyzed using a thematic approach informed by a prominent theoretical model of disablement. Results suggest that images contained no representation of disability. In contrast, magazine text included an abundance of references to disability; however, these mentions predominately aligned with constructs found early in the disablement process and strongly focused on physical and mobility limitations. These findings expand upon previous research examining the underrepresentation of marginalized groups within yoga media and illuminate a paucity of relevant information for individuals with disabilities who are interested in and may benefit from yoga practice. Disability is defined as the manifestation of a physical or psychological limitation within the context of the social environment. People with disabilities (PWDs) represent the world's largest minority group, with approximately 15% of individuals experiencing some type of disability. The population of PWD is heterogeneous, including people from all races, ethnicities, genders, and ages, and encompassing a variety of conditions. For example, disabilities can be categorized by type, including physical, cognitive, emotional, and developmental disabilities; they are also often described as congenital (present at birth) or acquired as a result of injury, aging, health condition, or other event. As the global population continues to age and chronic disease increases in prevalence, the number of people transitioning into disability is expected to rise. Nagi first described the disablement process as a pathway from pathology (e.g., diagnoses of disease or congenital conditions) to impairment (e.g., abnormalities within specific body systems) to functional limitation (e.g., restrictions in basic actions) to disability (e.g., difficulty performing basic and instrumental activities of daily life)., Verbrugge and Jette added three categories reflecting socio-cultural factors that influence disablement and factors relevant to those who assume disability as a social identity or lifelong status: predisposing risk factors (e.g., demographic, social, or environmental factors); extraindividual factors (e.g., medical care, external supports); and intraindividual factors [e.g., lifestyle changes, psychosocial attributes; [Figure 1]. 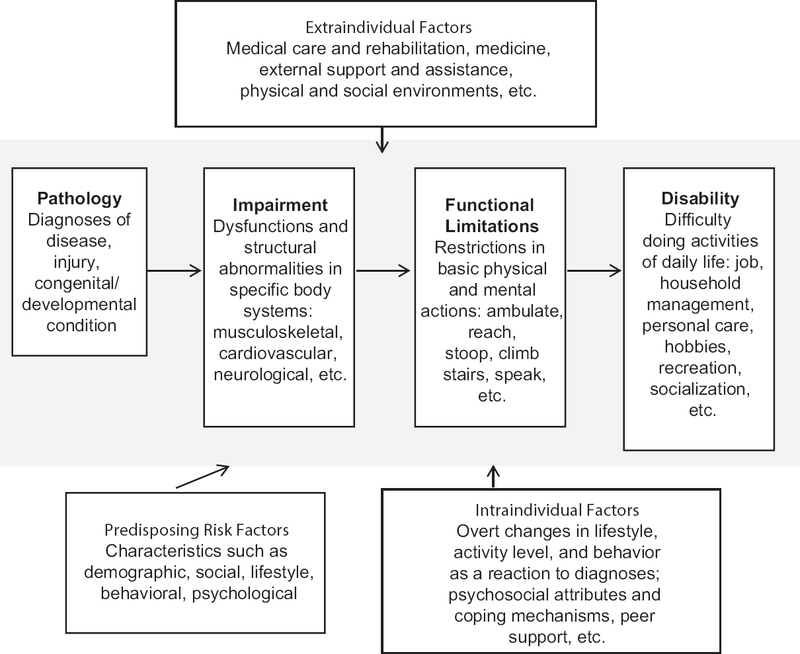 This model has been used widely in research describing health among PWDs. PWDs experience significant health disparities. The percentage of PWDs who go without seeing a doctor annually due to cost (27%) more than doubles that of the nondisabled (12.1%). PWDs report higher rates of smoking (28.8.% vs. 18.0%) and physical inactivity (54.2% vs. 32.2%) than those without disabilities. Mental health is also a concern, as rates of depression are up to 10 times higher among PWD than in the general population. Disparities in health and access to care among PWD are influenced by many upstream social factors, including environmental barriers (e.g., transportation and lack of accessible equipment in medical offices) and social barriers (e.g., lack of social support and discrimination). Despite yoga's numerous potential benefits, scholars and activists are concerned that dominant media representations of yoga and its practitioners may limit the perceived accessibility of the practice. Previous analyses of mainstream yoga print media suggest that these outlets contain limited visual representations of men, older adults, people of color, and people of larger body size, and that these representations have become increasingly narrow over the past four decades,, potentially discouraging people from trying yoga despite its health benefits. It is not known whether mainstream yoga media outlets include visual representations of PWD, nor if they include information that may be relevant to PWD who wish to practice, such as including images and information to address functional or physical factors (e.g., use of props to make asanas more accessible) and social or environmental factors (e.g., featuring instructors trained in accessible yoga) that may enhance their participation. The present study sought to explore themes related to disability within the images and the text of Yoga Journal magazine (YJ). This study was guided by Verbrugge and Jette's disablement model. Aligning the present study with this model allowed us to explore if YJ includes images and contents related to disability and describe the context in which any references are made. We examined the text and imagery within the “Yogapedia” sections of the 17 issues of YJ published during the 2015 and 2016 calendar years. We chose to analyze the “Yogapedia” section because it provides instructions for moving through a series of poses, accompanied by images displaying each step. The section also provides an introduction contextualizing the movement, describing its origins and potential benefits of performing the pose sequence [Figure 2], and introducing the yoga teacher who created the sequence. We coded 230 images and 340 paragraphs of text; to avoid misinterpretation of data due to the multiple images of the same yoga teacher or model frequently used in each section, analyses were based on the sample of 17 issues. Two independent coders rated the data using a guide developed based on those used in previous researches and on the disablement model., The coders trained using images extracted from previously published YJ issues and reached acceptable inter-rater reliability on training images. Each coder independently rated each text section and its accompanying images. We assessed inter-rater reliability to ensure consistency in coding across the two coders. Cohen's kappa values were computed for categorical codes, with values of 0.70 or greater indicating acceptable agreement. Kappa values ranged from 0.70 to 1.0. Intra-class correlations (ICC) were computed to assess the degree of coder agreement for continuous variables. ICC values ranged from 0.91 to 0.95. Models were rated 83.3% female, 100.0% Caucasian or European-American, and predominately in their 30s (38.9%), although the sample also included an appreciable presence of models in their 60s and older (22.2%). Approximately three-quarters of the models were of low-normal weight (72.2%; BMI = 19–22); 16.7% were of normal weight (BMI = 25); and 11.1% were rated slightly overweight (BMI = 28). No models were rated underweight or obese. No images represented disability in any way. Numerous references were made to the constructs of pathology, impairment, and functional limitation; these constructs were found in 70.6%, 88.2%, and 58.8% of the sections, respectively. Primary prevention was discussed in 88.9% of the sections. Predisposing risk factors and extraindividual factors were referenced in 29.4% and 11.8% of the sections, respectively. Neither disability nor intraindividual factors were referenced in any way. The present study presents the first-known analysis of disability themes within yoga media. This analysis is timely given the growing global prevalence of disability and increasing recommendations by health-care providers and yoga therapists to use yoga to treat and self-manage disabling conditions. Despite considerable evidence that yoga might benefit PWD, YJ does not explicitly represent this group in its imagery, sending the visual message that yoga is only for the able bodied. Future research might explore the reactions of PWD to the imagery in yoga media and how such exposure may influence their interest in and experiences practicing. The demographic and body-related attributes of models in the imagery analyzed align with those found in previous research, in that models were overwhelmingly female and of low-normal weight, and lacked representation of people of color. In contrast to the findings of previous research, the sections featured a considerable presence of models over the age of 60. Differences in the areas of magazine content analyzed in these studies may explain this difference; previous research analyzed cover models and advertisement models, whereas the present study focused on content within the magazine. Future research might explore model diversity in different sections of yoga media and the effects of any such differences on diverse readers' perceptions of the publication and of yoga practice. YJ included numerous textual references to disability. References were made at the levels of pathology, impairment, functional limitation, and primary prevention. These constructs are found early in the disablement process and reflect conditions that may be temporary (e.g., injury), can be changed by working to correct them (e.g., flexibility or range of motion, to an extent), and are less likely to affect the overall quality of life. These references indicate that the magazine provides relevant information for people who experience disability as a result of aging or due to chronic health conditions, who may be early on in the disablement process. The sections of the magazine analyzed contained fewer references to predisposing risk factors and extraindividual factors, and no references to disability or intraindividual factors. These constructs are further in the disablement process and reflect disability as an identity and lifelong condition influenced heavily by environmental and social barriers, rather than solely by individual physical condition. By excluding these factors, the magazine neglects to provide a complete range of relevant information for individuals who identify with disability as a lifelong status, for example, those with congenital disabilities or permanent injuries who are further along in the disablement process. YJ's stance related to disability overall seems to focus more on physical capabilities rather than recognizing disability within a social context. The present study is not without limitations. We analyzed issues from only 2 years of YJ's 40 years in circulation, and we chose to analyze only one mainstream yoga magazine, so results cannot be generalized to the entire publication history of YJ, nor to the entire body of yoga media. A previous analysis of YJ magazine advertisements over the entire 40-year time period suggests that the magazine has become more exclusive in its visual representations, including fewer racially and ethnically diverse models, for example, as time passed. Exploring a broader sample of issues to provide a more complete picture of the magazine's inclusion of disability-related content throughout its publication history is needed. Relatedly, we analyzed only one section within YJ print magazines. This sampling may provide a limited representation of all YJ print magazine contents and excludes its online content. In 2010 and 2012, for example, YJ included articles related to accessible yoga in its online “Namaste Blog.”, Researchers might consider comparing print and online media outlets to explore whether representations of diversity are more frequent in online publications, and assess the implications of any such findings. Our study confirms and extends previous research suggesting that, although yoga has the potential to benefit every body, mainstream yoga media's visual representations of the practice are narrow and may hinder participation from individuals and groups who remain unrepresented. YJ and other yoga media outlets ought to consider diversifying their content and particularly their imagery to include and be relevant for a broader range of yoga practitioners, including PWDs. Verbrugge LM, Jette AM. The disablement process. Soc Sci Med 1994;38:1-4. World Health Organization. World Report on Disability. World Health Organization; 2011. Nagi S. Some conceptual issues in disability and rehabilitation. In: Sussman MB, editor. Sociology and Rehabilitation. Washington, DC: American Sociological Association; 1965. Krahn GL, Walker DK, Correa-De-Araujo R. Persons with disabilities as an unrecognized health disparity population. Am J Public Health 2015;105 Suppl 2:S198-206. Thompson K. Depression and Disability: A Practical Guide. North Carolina Office on Disability and Health, Chapel Hill, NC, USA;2002. Haider T, Sharma M, Branscum P. Yoga as an alternative and complimentary therapy for cardiovascular disease: A systematic review. J Evid Based Complementary Altern Med 2016. pii: 2156587215627390. Youkhana S, Dean CM, Wolff M, Sherrington C, Tiedemann A. Yoga-based exercise improves balance and mobility in people aged 60 and over: A systematic review and meta-analysis. Age Ageing 2016;45:21-9. National Center on Health, Physical Activity, Disability. Yoga for Individuals with Disabilities; 2017. Available from: http://www.nchpad.org/295/1834/Yoga~for~ Individuals~with~Disabilities. [Last accessed on 2018 May 2]. Büssing A, Ostermann T, Lüdtke R, Michalsen A. Effects of yoga interventions on pain and pain-associated disability: A meta-analysis. J Pain 2012;13:1-9. Cramer H, Klose P, Brinkhaus B, Michalsen A, Dobos G. Effects of yoga on chronic neck pain: A systematic review and meta-analysis. Clin Rehabil 2017;31:1457-65. Field T. Yoga research review. Complement Ther Clin Pract 2016;24:145-61. Jeter PE, Haaz Moonaz S, Bittner AK, Dagnelie G. Ashtanga-based yoga therapy increases the sensory contribution to postural stability in visually-impaired persons at risk for falls as measured by the Wii balance board: A pilot randomized controlled trial. PLoS One 2015;10:e0129646. Schmid AA, Miller KK, Van Puymbroeck M, Schalk N. Feasibility and results of a case study of yoga to improve physical functioning in people with chronic traumatic brain injury. Disabil Rehabil 2016;38:914-20. Sharpe PA, Wilcox S, Schoffman DE, Hutto B, Ortaglia A. Association of complementary and alternative medicine use with symptoms and physical functional performance among adults with arthritis. Disabil Health J 2016;9:37-45. Cohen ET, Kietrys D, Fogerite SG, Silva M, Logan K, Barone DA, et al. Feasibility and impact of an 8-week integrative yoga program in people with moderate multiple sclerosis-related disability: A pilot study. Int J MS Care 2017;19:30-9. Curtis K, Hitzig SL, Bechsgaard G, Stoliker C, Alton C, Saunders N, et al. Evaluation of a specialized yoga program for persons with a spinal cord injury: A pilot randomized controlled trial. J Pain Res 2017;10:999-1017. Vinoski E, Webb JB, Warren-Findlow J, Brewer KA, Kiffmeyer KA. Got yoga? : A longitudinal analysis of thematic content and models' appearance-related attributes in advertisements spanning four decades of yoga journal. Body Image 2017;21:1-5. Webb JB, Vinoski ER, Warren-Findlow J, Padro MP, Burris EN, Suddreth EM, et al. Is the “Yoga bod” the new skinny? : A comparative content analysis of mainstream yoga lifestyle magazine covers. Body Image 2017;20:87-98. Justice L, Brems C, Jacova C. Exploring strategies to enhance self-efficacy about starting a yoga practice. Ann Yoga Phys Ther 2016;1:1-7. Yoga Journal. Yoga Journal Media Kit; 2017. Yoga Journal International Editions. Available from: https://www.yogajournal.com/page/yoga-journal-international-editions. [Last accessed on 2018 May 2]. Freeman H, Vladagina N, Razmjou E, Brems C. Yoga in print media: Missing the heart of the practice. Int J Yoga 2017;10:160-6. Pulvers KM, Lee RE, Kaur H, Mayo MS, Fitzgibbon ML, Jeffries SK, et al. Development of a culturally relevant body image instrument among urban African-Americans. Obes Res 2004;12:1641-51. Pulvers K, Bachand J, Nollen N, Guo H, Ahluwalia JS. BMI-based norms for a culturally relevant body image scale among African-Americans. Eat Behav 2013;14:437-40. Scharf A. Yoga therapy: The newest health trend that doctors are paying attention to. Huffington Post; 2016. Available from: https://www.huffingtonpost.com/avital-scharf/yoga-therapy-the-newest-h_b_11777622.html. [Last accessed on 2018 May 2]. Isaacs N. Those Who Can, Teach; 2010. Available from: https://www.yogajournal.com/lifestyle/those-who-can-teach. [Last accessed on 2018 May 2]. Yoga Journal Editors. Accessible Yoga; 2010. 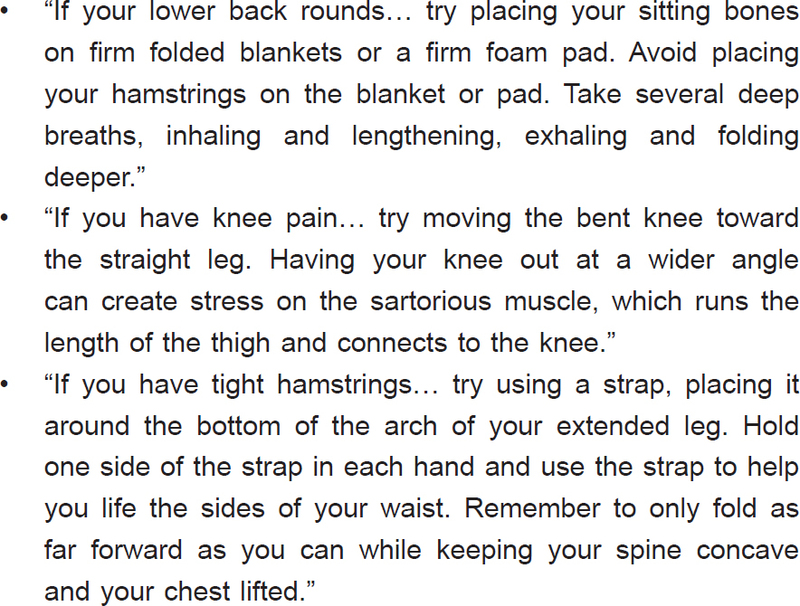 Available from: https://www.yogajournal.com/blog/accessible-yoga. [Last accessed on 2018 May 2].